Previous meta-analyses of treatments for Bell's palsy are still inconclusive due to different comparators, insufficient data, and lack of power. We therefore conducted a network meta-analysis combining direct and indirect comparisons for assessing efficacy of steroids and antiviral treatment (AVT) at 3 and 6 months. We searched Medline and EMBASE until September 2010 using PubMed and Elsviere search engines. A network meta-analysis was performed to assess disease recovery using a mixed effects hierarchical model. Goodness of fit of the model was assessed, and the pooled odds ratio (OR) and 95% confidence interval (CI) were estimated. Six studies (total n = 1805)were eligible and contributed to the network meta-analysis. The pooled ORs for resolution at 3 months were 1.24 (95% CI: 0.79 - 1.94) for Acyclovir plus Prednisolone and 1.02 (95% CI: 0.73 - 1.42) for Valacyclovir plus Prednisolone, versus Prednisolone alone. Either Acyclovir or Valacyclovir singly had significantly lower efficacy than Prednisolone alone, i.e., ORs were 0·44 (95% CI: 0·28 - 0·68) and 0·60 (95% CI: 0·42 - 0·87), respectively. Neither of the antiviral agents was significantly different compared with placebo, with a pooled OR of 1·25 (95% CI: 0·78 - 1·98) for Acyclovir and 0·91 (95% CI: 0·63 - 1·31) for Valacyclovir. Overall, Prednisolone-based treatment increased the chance of recovery 2-fold (95% CI: 1·55 - 2·42) compared to non-Prednisolone-based treatment. To gain 1 extra recovery, 6 and 26 patients need to be treated with Acyclovir and prednisolone compared to placebo and prednisolone alone, respectively. Our evidence suggests that the current practice of treating Bell's palsy with AVT plus corticosteroid may lead to slightly higher recovery rates compared to treating with prednisone alone but this does not quite reach statistical significance; prednisone remains the best evidence-based treatment. Bell's palsy is a condition characterized by an acute onset of facial nerve palsy with no known cause. The incidence is about 20/year/100,000 population, and leads to a considerable disturbance in social activities among patients. Although the actual cause of Bell's palsy is unknown, the widely accepted mechanism is inflammation of the facial nerve during its course through the bony labyrinthine part of the facial canal, which leads to compression and demyelination of the axons, and disruption of blood supply to the nerve itself. Previous studies have suggested viral infection as the etiology of the disease based on serological evidence;[4, 5] for example, positive serology for Herpes Simplex virus (HSV) has been reported in 20-79% of patients. Treatment of Bell's palsy varies, and no clear consensus exists. Most physicians prescribe corticosteroids as a primary treatment due to its potential to reduce swelling and inflammation. The addition of antiviral treatment (AVT) such as Acyclovir or Valacyclovir is aimed at eradication of HSV infection. Acyclovir, a nucleoside analog, inhibits HSV replication through inhibition of viral DNA polymerase. It is absorbed slowly from the gastrointestinal tract, necessitating the use of a five-times daily regimen. Valacyclovir, a Valine derivative of Acyclovir, is claimed to lead to higher drug levels through conversion to Acyclovir by intestinal and hepatic esterase enzymes, leading to less intensive regimens. Its distribution, cellular kinetics, mechanism, and excretion are otherwise identical to Acyclovir. Efficacy of AVT in Bell's palsy is still not established, and the question exists whether adding AVT to another treatment such as corticosteroid can lead to better and faster recovery compared with corticosteroids alone or without treatment. The original Cochrane systematic review of this topic included 3 studies; these were heterogeneous however and could not be pooled. Since that date, there have been at least 3 more large individual studies[8–13] and 3 more recent meta-analyses [14–16] published, although the comparator groups vary considerably and make traditional direct meta-analysis difficult. The meta-analsis by de Almeida et al. applied logistic regression analysis to assess interation effects between corticosteroids and AVT, however this does not account for heterogeneity and did not estimate the individual effect of AVT(Acyclovir or Valacyclovir). Furthermore, the review combined adult and paediatric studies (6 studies), in which dosages and effects of treatments may be different. The most recent update of the Cochrane systematic review included 6 studies , but did not look at the effects of AVTs alone. We therefore conducted a systematic review and network meta-analysis with the aim of comparing complete recovery rates at 3 and 6 months for corticosteroids, AVT (Acyclovir or Valacyclovir), or the combination of both for treatment of adult Bell's palsy. Performing a network meta-analysis by borrowing information from indirect comparisons integrates information about relative treatment efficacy[18–20]. This technique has been applied in systematic reviews of other clinical topics such as chronic insomnia, polymer-based drug-eluting stents, and highly-active AVT. One author (NP) located studies in MEDLINE (from 1966 to August 2010) and EMBASE (from 1950 to September 2010) using PubMed and Ovid search engines. Search terms used were as follows: (Bell's palsy or idiopathic facial palsy) and (antiviral agents or acyclovir or valacyclovir), limited to randomized controlled trials. Search strategies for both databases are described in the additional file 1. Abstracts and/or full papers of identified studies were reviewed by one author (NP) and checked by another author (TA). Studies were included if they were RCTs, and studied subjects aged 18 years or older with sufficient data. Non-English papers were excluded from the review. Where eligible papers had insufficient information, corresponding authors were contacted by e-mail for additional information. The reference lists of the retrieved papers were also reviewed to identify relevant publications. Where there were multiple publications from the same study group, the most complete and recent results were used. Data extraction was independently performed in duplicate by PN and AT using a standardized data extraction form, which included study design, sample size, patient characteristics (i.e., age, gender), type of intervention and comparator, outcomes, and follow-up time. Any disagreement was resolved by discussion. Quality of studies was also independently assessed by PN and AT based on a modified Jadad score which takes into account randomization technique, allocation concealment, blinding, intention to treat, and patient attrition. Each item was graded 2, 1, or 0 for appropriately, partially, and inappropriately described methods. Any disagreement between the two reviewers was discussed and resolved by consensus. Complete recovery was defined as a score ≤2 on the House-Brackman Facial Recovery scale[12, 13, 25], ≥ 8 on the Facial Palsy Recovery Index, > 36 points on theYanagihara score, or 100 on the Sunnybrook scale. For direct meta-analysis, the odds ratio (OR) and variance of each study were estimated and pooled. Heterogeneity of ORs was assessed using Cochran's Q test and I2. If heterogeneity was present, ORs were pooled using the random effects model, i.e. Der-Simonian and Laird method. Meta-regression was applied to assess whether age, gender, and QA were sources of heterogeneity, if these data were available. Contour enhanced funnel plots were used to detect publication bias due to small study effects [26–29]. Trim and fill meta-analysis was applied to impute the number of missing studies . For network meta-analysis, treatment groups were considered in a mixed effects hierarchical model with logit link function using the xtmelogit command in STATA. The treatments were included in the model as fixed effects whereas the study was included as a random effect. Likelihood estimates were used for estimation of parameters in the model. Goodness of fit of the model was assessed using the Hosmer-Lemeshow Chi-square test. The pooled ORs and 95% confidence intervals (CI) were estimated by exponential coefficients of treatments. Discrepancy of treatment effects between direct and indirect meta-results was then assessed using the standardized normal method (Z), i.e. by dividing the difference by its standard error[20, 32]. Number needed to treat/harm (NNT/NNH) was estimated using probability of complete recovery and ORs derived from the mixed effects hierarchical model, where the ORs were converted to risk ratios following the method of Zhang et al. All analyses were performed using STATA version 11.0. P values < 0·05 were considered as statistically significant except for the heterogeneity test where <0·10 was used. A flow diagram of study selection is shown in Figure 1. 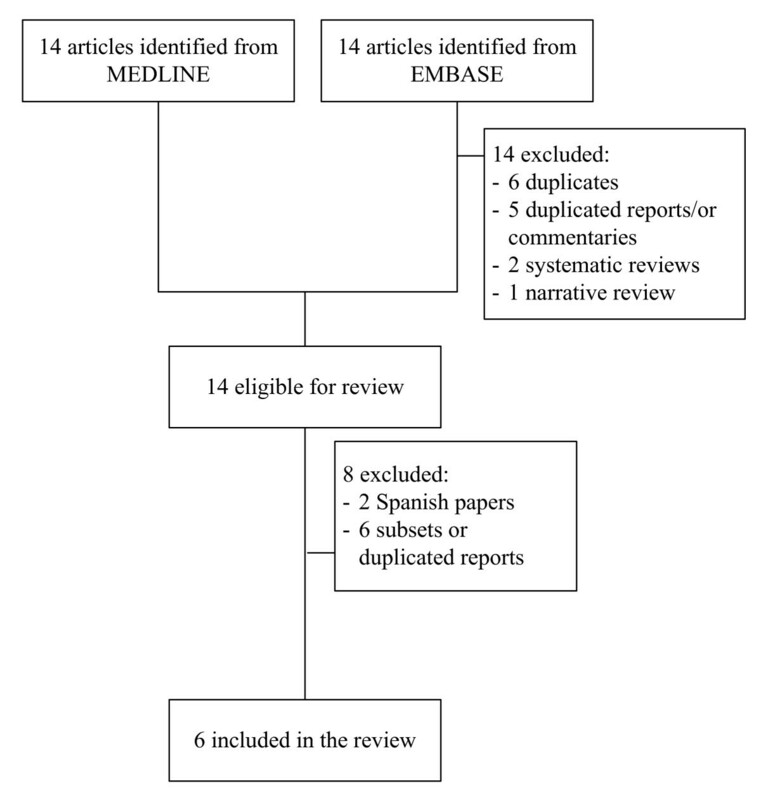 Fourteen and twenty-five studies were identified from MEDLINE and EMBASE databases, respectively. Among these 39 studies, 1 studies were duplicates, 13 studies were ineligible, leaving 12 studies to review. Six studies were excluded; two were in Spanish, one was in German, and 3 were subsets or duplicated reports, leaving six studies[8–10, 12, 13, 25] with a total of 1805 patients for analysis. Characteristics of the 6 included studies are described in table 1. Five studies[8–10, 12, 13] compared recovery rates of AVT plus corticosteroid with corticosteroid alone or placebo; the remaining study directly compared the recovery rate of AVT against corticosteroid. Two studies were based on factorial design[9, 12] and the others were parallel randomized control trials. The AVTs used were Acyclovir for 4 studies[8, 12, 13, 25] and Valacyclovir for the other 2 studies[9, 10]. Prednisolone was the major corticosteroid used. Mean age of participants in these studies ranged from 40 to 50 years, and percentage of male participants ranged from 45% to 59%. Median quality assessment score was 8 (range = 2-12). Diagram of selection of studies. Among 6 studies, 3 studies[8, 12, 13] compared recovery rates within 3 months between Acyclovir plus Prednisolone versus Prednisolone alone (table 2). Pooled treatment effects were heterogeneous (Chi-sqaure = 6·30 (d.f. = 2) p = 0·043; I2= 68.3%). Using the random effects model gave a pooled OR of 1·39 (95% CI: = 0·52 - 3·75), i.e. patients who received Acyclovir plus Prednisolone were about 40% more likely to recover within 3 month than patients who received Prednisolone alone, although this did not reach statistical significance. Only 2 studies[9, 10] compared recovery rates between Valacyclovir plus Prednisolone and Prednisolone. They were homogeneous and the pooled OR with fixed effect model was 1·17 (95% CI: 0·75 - 1·81). Combining 5 studies[8–10, 12, 13] to assess the effect of AVT (Acyclovir/Valacyclovir) plus Prednisolone versus Prednisolone found moderate heterogeneity (Chi-sqaure = 7.78 (d.f. = 4) p = 0.100; I2 = 48.6%). The pooled OR with a random effect model was 1.21 (95% CI: 0.77 - 1.89), i.e. AVT plus Prednisolone had 21% higher chance of complete recovery than Prednisolone alone but this was non-significant. Meta-regression suggested that quality assessment score and disease severity at baseline might be a source of heterogeneity, reducing I2 from 48.6% to 32.5% and 15.5% respectively although both variables were non-significantly associated with treatment effects. Pooling studies with quality assessment scores > 8 (median) suggested no benefit of AVT plus Prednisolone compared with Prednisolone alone (pooled OR = 1.01, 95% CI: 0.74 - 1.37). Two studies[8, 10] had more severe patients at baseline (i.e., mean scores were 3 by facial palsy recovery index and 15 by Yanagihara score) compared with the other 3 studies[9, 12, 13] (i.e., mean scores were 3.6 to 4 by HB), see table 1. Pooling within the severe group only suggested the possibility of a treatment effect but this was non-significant (OR = 2.04, 95% CI: 0.93 - 4.46) while treatment effect was close to the null in the less severe group (OR = 0.94, 95%CI: 0.66 - 1.33). Contour enhanced funnel plots suggested asymmetry, i.e., four studies lay in the non-sigificant area (white, p > 5%) but the study with the largest treatment effect and SE lay in the positive-moderate significant area (1% ≤ p ≤ 5%, see Figure 2), suggesting that the asymmetry might be due to missing, non-significant studies. "metatrim" analysis indicated that only one negative study with borderline significance was missing; adjusting for this presumed missing studies resulted in an ORof 1.08 (95% CI: 0.66 - 1.76). Contour enhanced funnel plot: AT plus Prednisolone versus Prednisolone. Three studies[8, 12, 13] reported the recovery rate between direct comparisons of Acyclovir plus Prednisolone versus Prednisolone after receiving treatments at 4 to 9 months (table 2). Treatment effects were statistically heterogeneous (Chi-square = 6·07 (d.f. = 2), p = 0·048; I2 = 67·0%), and the random effects pooled OR was 1·63 (95% CI: 0·47 - 5·75). Pooling effects of Valacyclovir plus Prednisolone versus Prednisolone was performed based on only 2 heterogeneous studies[9, 10]. The random effects pooled OR was 1·58 (95% CI: 0·55 - 4·48). There was only 1 study each that compared Acyclovir or Valacyclovir alone versus Prednisolone and this was insufficient for pooling. All six studies[8–10, 12, 13, 25] were able to contribute to a network meta-analysis, for a total of 1,805 patients, as described in table 2. Overall, 177 (9·8%), 207 (11·5%), 567 (31·4%), and 328 (18·2%) received only Acyclovir, Valacyclovir, Prednisolone, or placebo whereas 206 (11·4%) and 320 (17·7%) received Acyclovir plus Prednisolone and Valacyclovir plus Prednisolone, respectively. One-thousand two-hundred and forty-three patients had complete recovery (68·9%) within three months. All treatment comparisons and results of the network meta-analysis for 3 month outcomes are displayed in Figure 3a. Each line in the figure represents a randomized comparison, in which the head and the tail of that line refer to intervention and reference groups respectively. Figures on the lines refer to estimated indirect ORs for that comparison; ORs less than one indicate that the intervention group had lower recovery than the reference group, whereas ORs higher than one mean that the intervention group had higher recovery than the reference group. The mixed-effects model with a random intercept and a constant slope was applied to assess treatment effects. The estimated variance between studies was 0·17 (95% CI: 0·04 - 0·76). Hosmer-Lemeshow test found that the model was a good fit (Chi-square = 12·99, p = 0·072). Comparisons of recovery rates between treatment groups: A network meta-analysis. a) at 3 months. Treatment effects for all comparisons are shown in Figure 3a and table 3. Adding Acyclovir or Valacyclovir to Prednisolone did not significantly increase recovery rate when compared with Prednisolone alone, although the point estimates suggest a potential benefit of the combination, i.e., ORs were 1·24 (95% CI: 0·79 - 1·94) and 1·02 (95% CI: 0·73 - 1·42) for Acyclovir and Valacyclovir, respectively. For monotherapy, either Acyclovir (OR = 0·44, 95% CI: 0·28 - 0·68) or Valacyclovir (OR = 0·60, 95% CI: 0·42 - 0·87) led to significantly lower recovery than Prednisolone alone and this was not significantly different compared with placebo (OR = 1·25, 95% CI: 0·78 - 1·98 for Placebo versus Acyclovir; OR = 0·91, 95% CI: 0·63 - 1·31 for Placebo versus Valacyclovir). These data indicate that Prednisolone led to higher recovery rates than not receiving Predisolone. We therefore combined all Prednisolone groups (regardless of additional AVT) compared with non-Prednisolone (i.e., Acyclovir, Valacyclovir, and Placebo). The estimated OR was 1·94 (95% CI: 1·55 - 2·42), i.e., Prednisolone-based treatment increase the chance of recovery by 3 months by 2 fold compared to non-Prednisolone-based treatment. These effects were largely consistent when recovery was judged at later time points (Figure 3b and table 3). Acyclovir (OR = 1·74, 95% CI: 0·93 - 3·24) or Valacyclovir (OR = 1·15, 95% CI: 0·78 - 1·69) added to Prednisolone tended to improve recovery rates compared to receiving Prednisolone alone but the effects were non-significant. Mono-therapy with either Acyclovir (OR = 0·33, 95% CI: 0·18 - 0·68) or Valacyclovir (OR = 0·55, 95% CI: 0·37 - 0·81), or placebo (OR = 0·62, 95% CI: 0·43 - 0·88) led to significantly lower recovery than Prednisolone mono-therapy. Compared with Acyclovir, Acyclovir or Valacyclovir plus Prednisolone was more beneficial than Acyclovir alone, with ORs of 5·21 (95% CI: 2·48 - 10·94) and 3·45 (95% CI: 1·78 - 6·68) respectively; trends were similar for Valacyclovir. Overall, the effect of prednisolone-based regimens compared to those without prednisolone was similar to that at 3 months, with OR of 2·04 (95% CI 1·57 - 2·64). Results of direct and network analyses are compared in the last column of table 3. Direction of treatment effects between both methods were similar for all comparisons, although the direct approach provided higher treatment effects in both positive and negative directions. The degree of discrepancy between the 2 methods was very small except for Acyclovir versus Prednisolone, where Z was large and significant at 3 and 6 months (1·77, p = 0·077; and -2·93, p = 0·002 respectively). 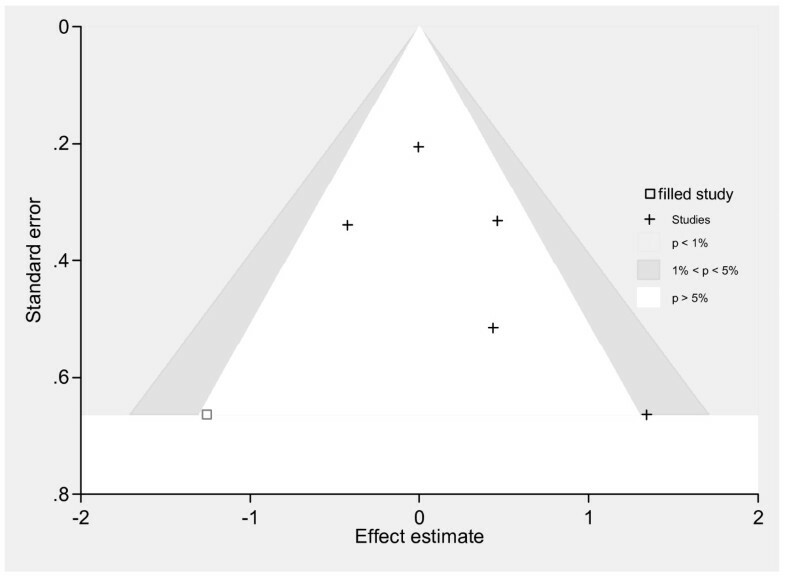 Precision of treatment effects was generally higher in the network meta-analysis than the direct one. Finally, estimates of NNT and NNH for recovery at 3 and 6 months are given in table 4. We found that 6 patients need to be treated with Acyclovir and prednisolone compared to placebo in order to gain 1 extra recovery and this had a tight confidence interval. By contrast, the benefit of combination AT and prednisolone compared to prednisolone alone was less certain, with 26 patients needing to be treated with Acyclovir plus predinisolone in order to gain 1 extra patient with recovery at 3 months, and this had wide confidence intervals. Our network meta-analysis indicates that treatment with AVT alone or placebo is significantly inferior to Prednisolone alone; the effect of AVT alone and placebo are similar to each other. Current practice of adding AVT (either Acyclovir or Valacyclovir) in the regimen with Prednisolone may increase disease recovery rates compared with Prednisolone alone, but at this point this difference is not statistically significant. Prednisolone remains the strongest evidence-based treatment, whether compared to placebo or AVT monotherapy. corticosteroids reduces the inflammatory process in Bell's palsy and this facilitates remyelination of facial nerve. There may be a small incremental increase in efficacy but there is not sufficient power, even with all the trials to date, to demonstrate this. Large RCTs are needed to specifically compare corticosteroid and corticosteroid plus AVT. one systematic review included 3 studies with 117 patients and demonstrated no benefit of using corticosteroid compared with placebo/vitamin with relative risk of 0·86 (95% CI: 0·47 - 1·59). Another review included 5 studies with 709 samples and reported no benefit of AVT (OR = 1·03; 95% CI: 0·74 - 1·42) when compared with Prednisolone. The small numbers in these previous meta-analyses clearly led to lack of power. Two more complete reviews[14, 17] were recently published. One accessed unpublished and non-English papers and thus included more studies than other previous meta-analyses. Point estimates of treatment effects for our results were similar to theirs, although confidence intervals varied. For instance, the effect of corticosteroid versus placebo at longer than 3 months was 0.54 in our study versus 0.69 for the recent meta but our study was slightly less precise (95% CIs were 0.40 - 0.74 versus 0.55 - 0.87, respectively). Effect of AVT plus corticosteroid versus AVT alone was also similar, i.e. the odds ratios for recovery were 0.49 (95% CI: 0.36 - 0.66) versus 0.48 (95% CI: 0.29 - 0.79). Our results are also consistent with the updated Cochrane review  which found a possibility of benefit of AVT plus corticosteroid versus corticosteroid which did not reach statistical significance, with the pooled point estimate of 1.41, and with the de Almeida et al. review which also found borderline evidence for a synergistic effect of steroids and AVT. 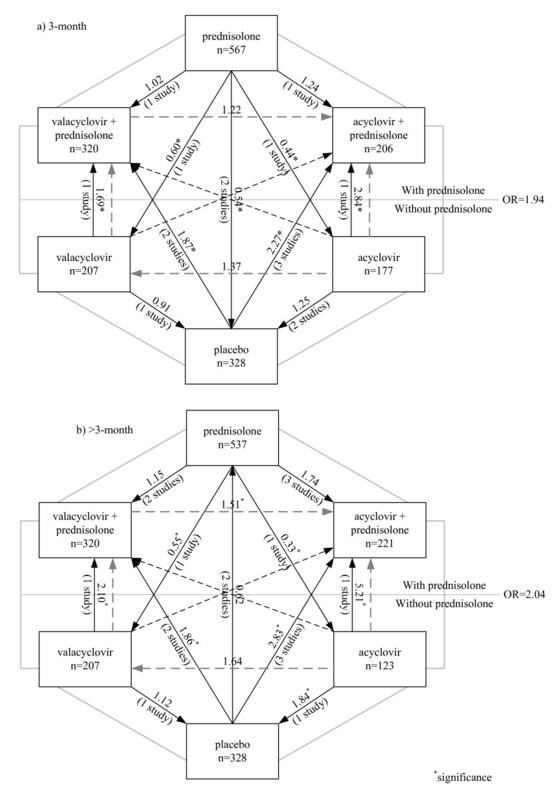 We have applied a mixed model for network meta-analysis[19, 31]. The mixed model gains power by integrating both direct and indirect comparisons. For instance, only two studies performed direct comparisons of Acyclovir plus Prednisolone versus Prednisolone alone, a total sample size of 409 (Table 2). The network method "borrowed" information on the Prednisolone group from three other studies and increased the total sample size to 773. Although our pooled estimates were quite heterogeneous, the mixed model with random intercept takes into account variation at the study level. In addition, goodness of fit assessment suggested that our model fit well with the data. Overall, our results are quite robust since discrepancies between the direct and the network analyses are small. Quality of included studies varied; quality assessment scores ranged from 2-12. Meta-regression of direct meta-analysis indicated that this might be a source of heterogeneity in pooling effects of AVT. However, we could not adjust for the effects of quality assessment score and other co-variables in the mixed effect model since this requires individual patient data. An individual patient data meta-analysis could be attempted, although individual level raw data are often difficult and more time consuming to access. However, with this method, covariables in both study (e.g., quality assessment) and individual levels (e.g., age, disease severity) can be assessed using a multi-level analysis approach. Our evidence suggests that the current practice of treating Bell's palsy with AVT plus corticosteroid may lead to slightly higher recovery rates at 3 and 6 months compared to treating with corticosteroid alone, although at this point the sum of the data do not show that this is a significant difference; prednisone remains the best evidence-based treatment. Treating with AVT alone is significantly worse than treating with corticosteroid alone and is no better than placebo.